Learning and development settings at work can be gamified too! An Coppens will teach you to employ the right techniques of gamification in L&D settings (Onboarding, Advancing Skill Sets, Training) where learners can complete their trainings, retain their knowledge and thrive the most. The 2-day workshop is very practical in nature, highly focused on cases that the participants will bring in with them. Each team will get to practise their gamification skills on a topic of their choice. An will share examples of epic fails and also her success stories. Come with a playful mindset! Improved learning experience - Gamification will allow a higher level of engagement in learning through the elements of fun. This leads to an increase in recall and attention. Improved learning environment- Gamification provides an efficient learning environment that helps learners practice real life situations and challenges in a safe environment. This leads to a more engaged learning experience that promotes better knowledge retention. Instant feedback - Gamification provides instant feedback that promotes confidence and engagement which increases recall and retention of knowledge. Rewarding behavioral change - When combined with the psychological principles of repeated retrieval and spaced repetition, gamification can drive strong behavioral change. 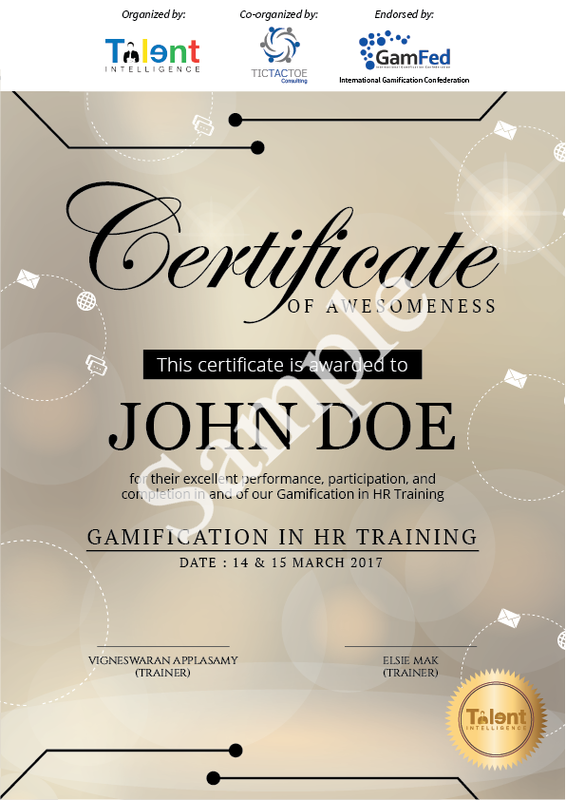 Vast application in learning needs - Gamification can be applied across most of a company learning needs including onboarding, sales, customer support, soft skills, awareness creation, and compliance. With learner exposure to social media and current day technology, the attitudes have changed towards learning. Gamification can offer one way to engage learners for longer, help them retain more and prove their skills. • What is changing with the workforce of today? • Why is it relevant? • Why is the time ripe for gamification initiatives? • Why do learners learn? • How do learners learn? An Coppens learning gamification framework, designed to capture a full learner journey through to mastery. How this works in an overview. • Why I designed it? Both learning styles and player types play a role in gamification design for learning. I matched the two frameworks to come up with a blend of learner player style. • What are the elements of proof? • Why does it matter and who does it matter to? SESSION 9: Beta, Alpha, GO! Iterations and testing are part of all good game design, hence in gamification, this is equally good practice. We will discuss data analysis and feedback to improve your project and steer it towards the desired business objectives. • Is it also fun?